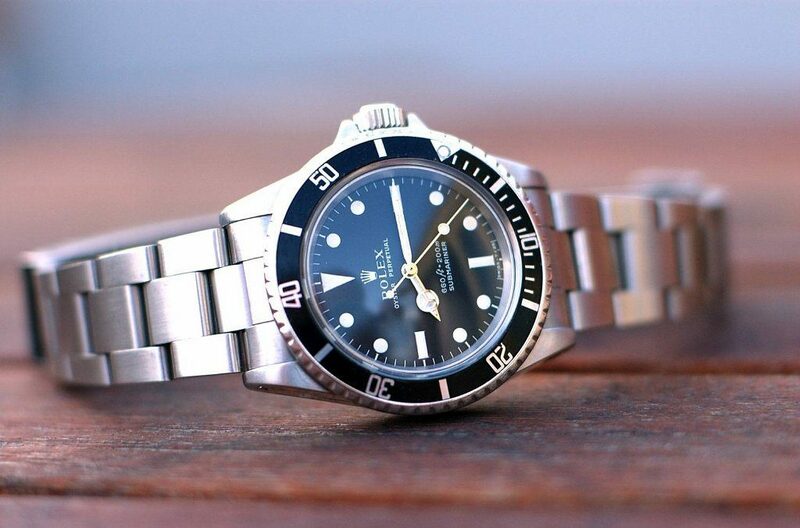 Rolex timepieces are some of the most recognisable and reputable on the market worldwide. Invented in 1908 by Hans Wilsdorf in Geneva, Switzerland, Rolex had soon become a synonym of the highest quality and timeless watch design. 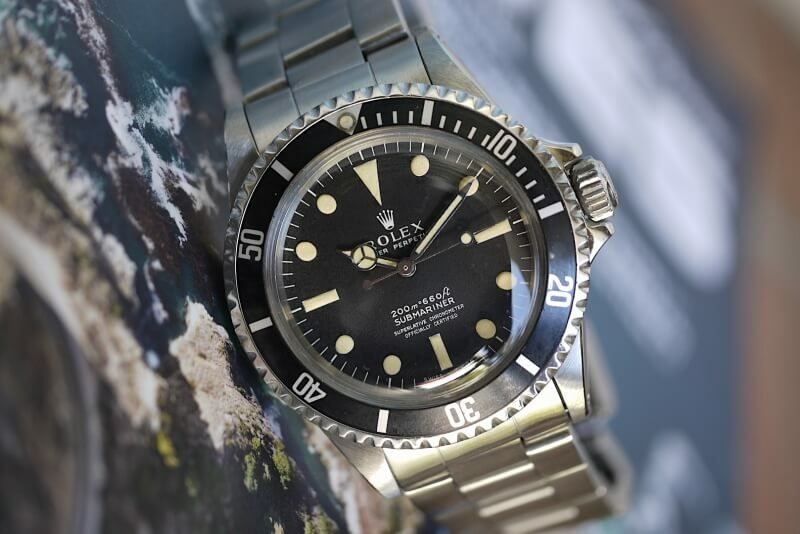 As one of the top 100 most recognisable and influential brands, Rolex is known to people all over the world, even those who are not familiar with the watch industry. Apart from being a leader in watch manufacturing, the company prides itself with a stellar reputation for its brand positioning and stability. In 2009 Steve McQueen’s 1967 Rolex Submariner was sold for 201,670 Euros at an auction event by Antiquorum. The watch was produced in 1967 and does not have a date. The watch was made with ordinary materials by Rolex, what makes it a one of a kind pieces is that it belonged to Steve McQueen. Steve McQueen was one of the most popular actors during the 60’s & 70’s and was known for commanding large salaries for his participation on movies. He received an Academy award for best Actor for his performance in The Sand Pebbles. The Paul Newman Ferrari Red Rolex Daytona is inspired by Ferrari and features a red and black dial making it easily the most recognizable watch on the list. The watch measures 37mm diameter, has 17 jewels and was sold for 230,000 Euros. Paul Newman was a race car driver and an actor. He won an Academy Award for Best Actor for his performance in 1986 film The Colour Of Money. Luxury products made of expensive materials always comes at a hefty price, the Rolex Platinum Diamond Pearl master is a perfect example. It is a limited-edition watch with a dial made of meteorite diamond and bezel decorated with 42 baguette diamonds. 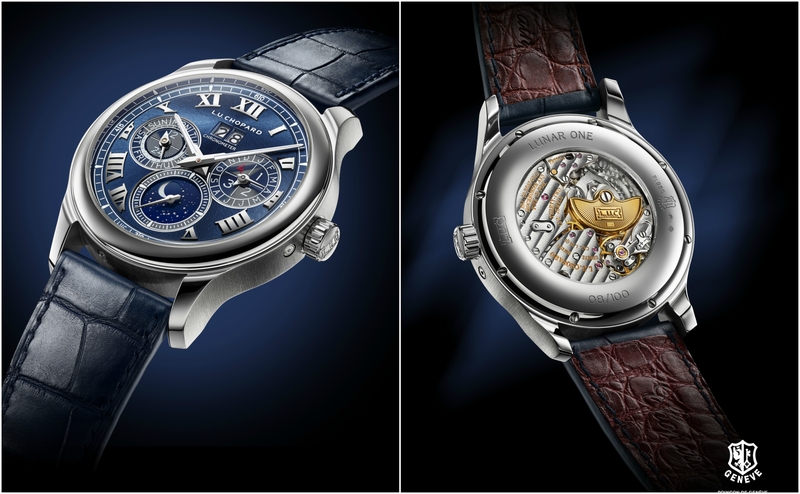 It also has a double quickset made of sapphire and measures 39mm. The Rolex Platinum Diamond Pearl master was released in 2011 and now is available at 198,000 Euros. On November 8th 2015 the Rolex Submariner was worn by Sir Roger Moore as James Bond sold for 314,000 at an Auction in Geneva. Manufactured in 1972 the watch was used as a prop in the 1973 James Bond movie Live and Let Die. The watch was heavily modified for the movie, most notably the bezel had been reshaped into a circular saw. In the movie the sharpened bezel is used to cut a rope and the watches ‘magnetic field’ to unzip Miss Caruso’s dress. Due to the modifications made to the watch it does not tell time, however on the inside contains an autograph of Sir Roger Moore. 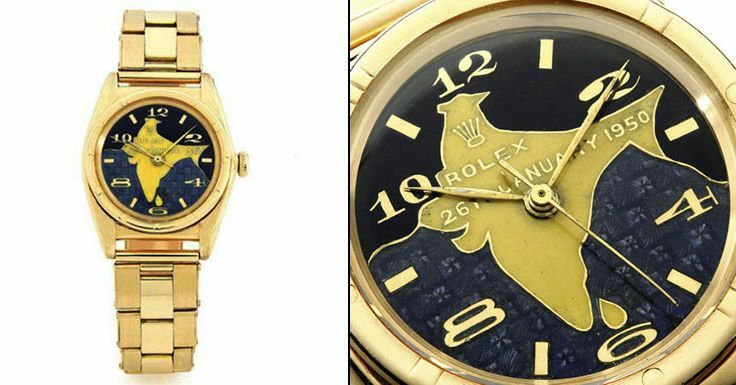 In 2011 the first president of India, Dr. Rajendta Prasads watch was announced that it would be auctioned off. The watch was a Oyster Perpetual made of 18 karats ever rose with a map of India featured on the dial. The date of India’s first constitutional day, January 26th, 1950 is also featured on the dial. There is reason to believe that Prasad received the watch as a gift during his inauguration. 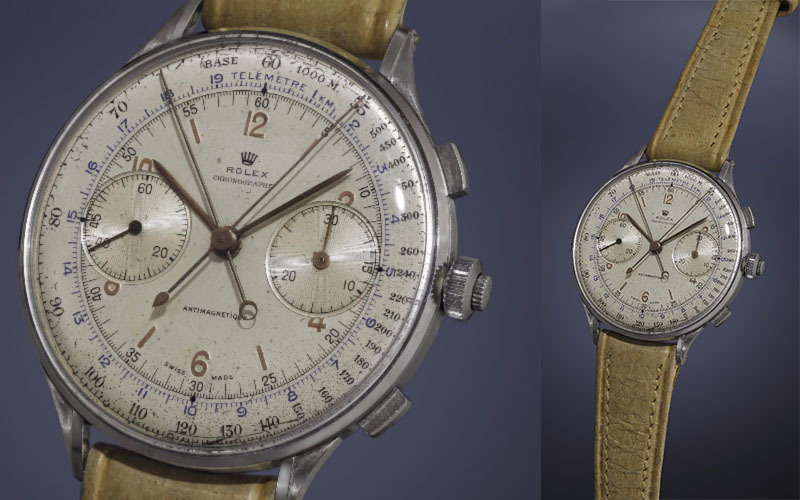 The maximum estimated value for Dr.Rajendra Prasad’s Rolex Oyster Perpetual watch was 383,000 Euros. However, the watch was never sold as the Indian government intervened on behalf of Prasads family who inform that authorities that the watch was stolen from then several years before. The Rolex GMT master II Ice id definitely a show stopper. 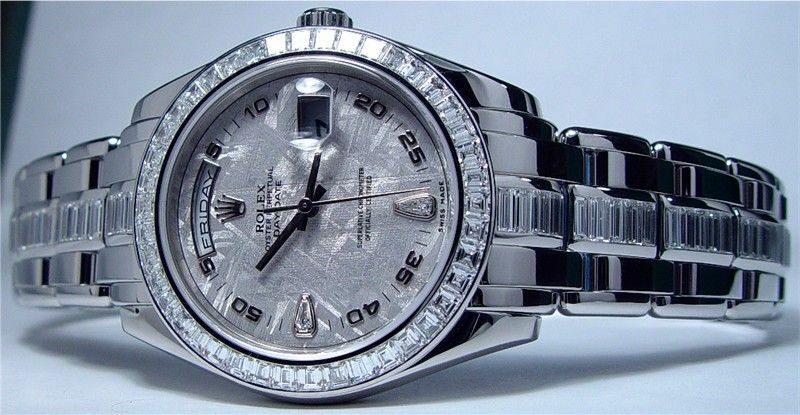 The entire watxch is covered with diamonds, in 2014 the watch was marked with the retail price of 420,000 Euros. 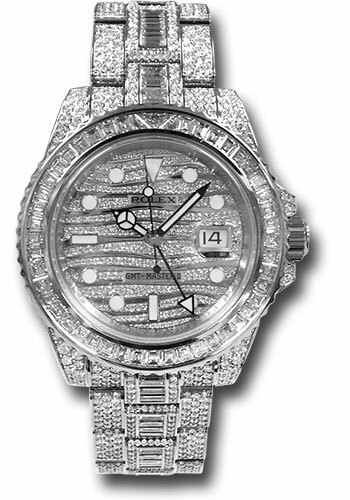 The Roles GMT Master II Ice is made of white gold and had numerous diamonds engulfing the watch. The dial also has a set of diamonds arranged in a wavy design and the bracelet is also completely covered with diamonds. For watch collectors who are also big fans for music, Eric Claptons Rolex ‘Oyster Albino’ Cosmograph Daytona is the holy grail of all watches. It sold for a million at an auction in Geneva in May 2015. 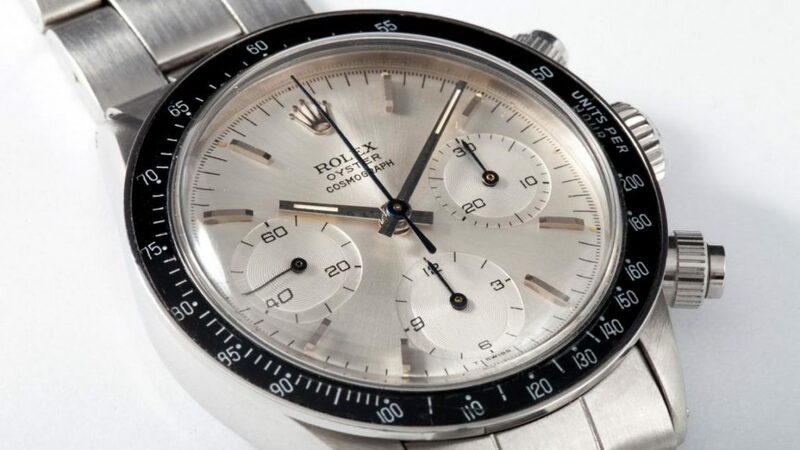 Manufactured in 1971, its an extremely unique piece as its just one of four examples with silvered chronograph totalizers in the same color as the silver dial, hence the ‘Albino’ moniker. Usually this watch has a black chronograph totalizer. It is housed in a stainless-steel case and is powered by a manually wound Calibre 727. The fact that it was once owned by Eric Clapton only boosted the price to an unprecedented territory. Eric Clapton known for the hit songs “Blue Eyes Blue,” “Wonderful Tonight,” and “Tears in Heaven” – bought the watch in the 1990s. In 1942 Rolex Antimagnetique is the largest Rolex ever made. The piece was auctioned in Geneva in May 2016 and was sold for almost 2 million euros. The 1942 Rolex Antimagnetique was never made available to the public. It was an exclusive watch given to a select group of racing teams and their drivers. With only 12 known pieces to exist the 44mm split second chronograph is one of the rarest watches in the world. It is encased in stainless steel and has a pair of subsidiary dials for constant and 30 minutes register. 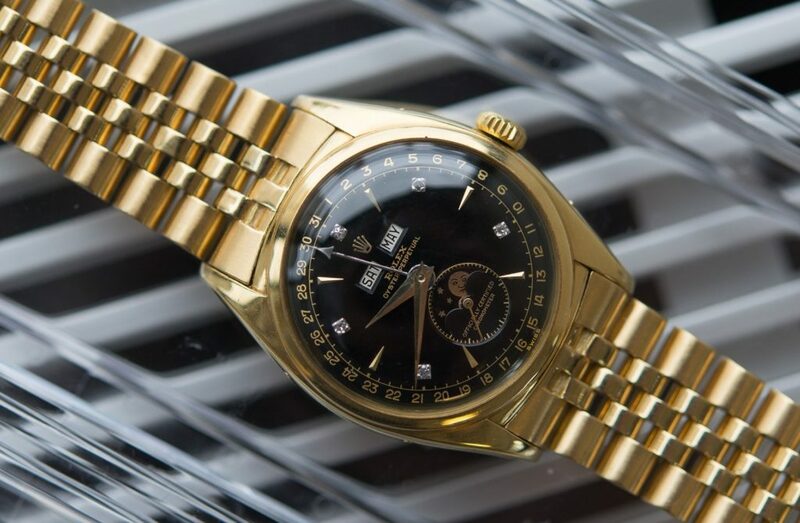 Owned by Bao Dai the last emperor of Vietnam, the Bao Dai Rolex is the second most expensive watch ever sold in auction. The timeless piece sold over 5 million euros at an auction in Geneva in May 2017. The Bao Dai Rolex is a one of a kind watch not just because of its original owner but due to that it was made from 18 karat yellow and the watch features a triple calendar with moon phase indicator. It has a black dial and includes a set of diamond markers on the even hours, except the 6. Bai Dai was the 13th emperor of the Nguyen Dynasty. He was named emperor and was given the name Bai Dia which means ‘Keeper Of Greatness’. Paul Newmans Rolex Cosmograph Daytona is one of the rarest and most highly sought-after watches in the world. In October 2017 the iconic watch became the most expensive ever sold in an auction, going for 17 million Euros. The watch was given to Paul Newman by his wife Joanne Woodward, who supposedly bought the watch from Tiffany & Co in New York and had it engraved ‘Drive Carefully Me’. Paul Newman wore the watch everyday for 15 years, then passed it down to his daughters then boyfriend in 1984. Introduced in 1963, the Rolex Cosmograph Daytona is so synonymous with Newman that the watch is often called the Paul Newman watch. 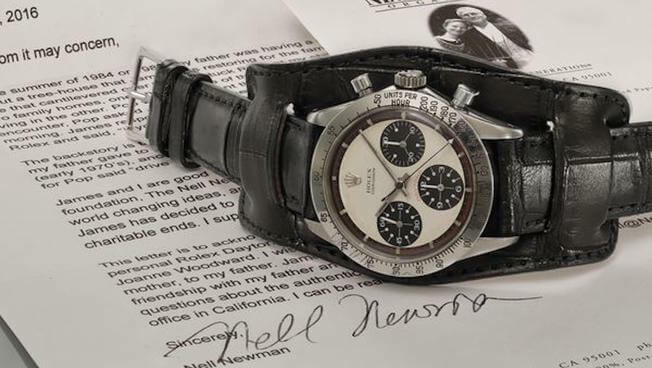 Several examples of the famous watch have been sold at a very high price over the years, however none of them have come close to the price as the one worn by Paul Newman himself.